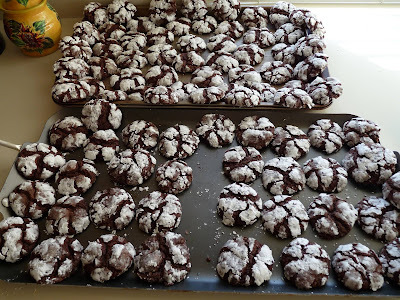 A Meaningful Life, A Better World: Chocolate Crinkles! These are the best cookies I make, but they take two days. Here is a much simpler version. Given that they are so intensive (relative to the amount of time I have for cooking), I double the below recipe. I bake half one day, and the rest a week later (the dough keeps in the fridge just fine). Also, I have tried to bake the cookies the same day as I put the dough together, and they just don't come out as good. I don't know why refrigerating them overnight is important, but there you are. Soften (but don't completely melt) chocolate as you prefer (I put in a glass 2 C measuring cup and microwave on low until soft). Mix oil, vanilla, and your chosen egg substitute (e.g., silken tofu). Add in sugar and blend very well. Mix flour, baking powder, and salt together. Mix that into the oil mixture. Chill dough overnight. Heat oven to 350 degrees, and lightly oil cookie sheets (unless you have nonstick sheets). Take about a spoonful of dough, shape into a ball, and roll in the powdered sugar. Place about 2" apart on cookie sheet. Bake for 10-12 minutes; they should spread out like in the picture above. Feed to non-vegans, and when they say how great they are, admit that the secret ingredient is tofu!